Between 1945 and 1952, Jussi Björling appeared eight times on The Voice of Firestone broadcasts, the one on this CD being the last. Included are all of Björling's portions with complete announcements and orchestral introductions. 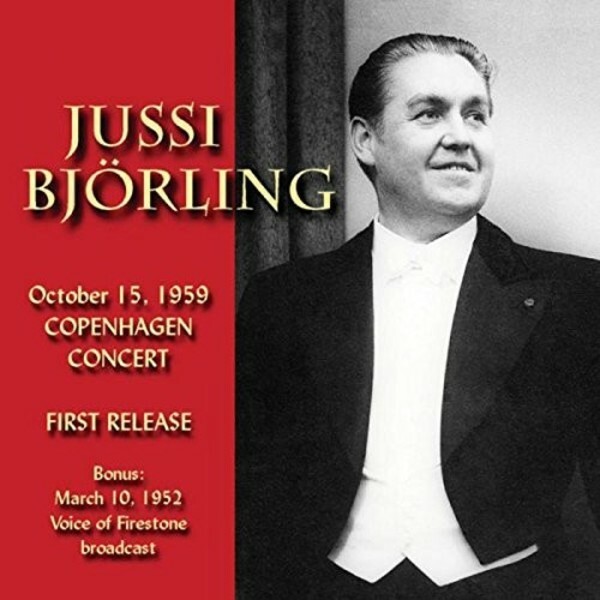 We are shown the 41-year-old Björling in fine form - his sincerity and artistry apparent throughout. Björling was a child prodigy. With his father David and his brothers he was part of the Björling Quartet which toured Sweden from 1922. He evolved into a solo artist, performing mainly in Scandinavia, although he made pre-war appearances in both England and the US. His first adult concert outside Sweden was in Copenhagen in 1931, resulting in his becoming equally beloved in Denmark. Throughout WW2 his Swedish nationality gave him neutral status, and he continued to perform in Denmark, to rapturous reception - his presence is generally held to have helped Danish morale. In 1945, he was one of the first European stars to perform in the US. Although many of his performances were recorded, nothing from Denmark seemed to have survived. That was until his very last Danish appearance - the 1959 concert presented here - was recently found. To say the least, it fully substantiates his stellar reputation.